For the past ten days I have been enjoying the 33% power increase that my new Seidio 1600mAh Extended Battery has provided me – it really has made a huge difference on my Treo 680 and I can finally end a day filled with calls with plenty of juice still to go. 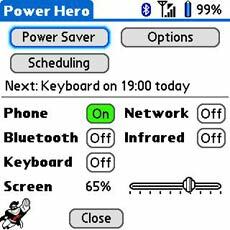 Having said this, a new Treo software solution aptly called Power Hero is now helping to take my enhanced battery performance even further. Power Hero provides me with a simple and easy to use console from which I can instantly see the status and control any one of the six main power-draining functions on my smartphone to help me deliver an estimated additional 20% power. The main Power Hero console screen (above) allows me to quickly see the current status of my Phone, Bluetooth, Keyboard (backlighting), Network (wireless data connection), Infrared and Screen (brightness) and make any necessary adjustments. In this case I have initially disabled all functions except obviously the Phone and also reduced my screen brightness from 76% to 65% since during the day I really don’t need it to be set higher. 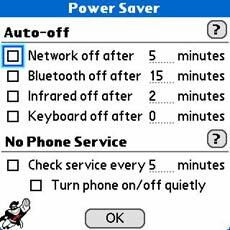 The next step clicking the Power Saver button allows you to set some Auto-Off preferences. For example, I really like the ability to automatically close my Network connection after a set number of minutes since typically when you use the Internet your wireless data connection stays on indefinitely draining and wasting precious Treo battery power. Additionally, another major power drain can occur when your Treo loses phone service (for example when riding on the subway) and Power Hero allows you to save battery life by automatically switching your phone off when no service is detected and retry connecting to the network after a set number of minutes. Finally, you can also set individual Schedules for all six power-draining functions. 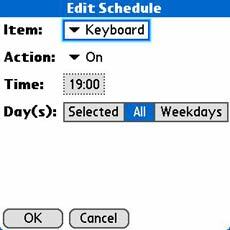 In my case I create a schedule to turn my Keyboard on at 19.00 every day and another to turn it back off at 6am (somewhat oddly you can’t simply set one schedule to On at one time and Off at another thus requiring two separate schedules). I also set a similar profile for my Screen with a brighter setting for the evening and a darker for the day. Overall I found Power Hero to be brilliantly simple – so much so in fact that one has to wonder why it had not been released sooner. In less than five minutes I was able to completely refine all the power-draining functions on my smartphone and so make sure that I am able to always extend the performance of my Treo battery to the max. Very highly recommended. Any lag issues noted with the auto bluetooth enabled? It is an excellent program, I have saved up to 30% of battery in my treo 680. 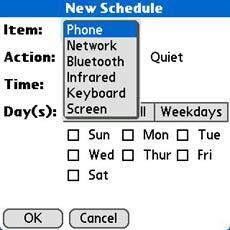 I programmed it so that bluetooth activates in the hours that I lead to my work, and I telephone becomes disconnected at night and automatically start before leaving to my work. I recommend them. Quick check of Power Hero listing on Treonauts site indicates no support for Treo 650. Any inside info on whether it was tested and/or whether it might be included in a (.1) release? forgot - it's not so much that there is a lag as the fact that sometimes the connection between your Treo and BT headset may not work properly. I think that it's both a headset and Treo specific issue and you will have to test it to see if it performs. Other than this the actual Auto On/Off of the Bluetooth works perfectly well. I suspect that there's something going on in my 680. It doesn't auto-disconnect the network and doesn't shut off the phone after no signal. There is a 1.03? beta out, available at the hobbyistsoftware website which may address some of the issues that people are reporting. Personally I love many of its features (keyboard off, telephone service checking, etc.) No bluetooth support on the 650, but I think that's more of a 650 issue. Andrew, thanks for the review. It raised a question I never thought about before. I always assumed infrared was only on when you chose to beam something. Is infrared always on by default? Would this work on a 755p? I've been testing it on a 755p and it seems to work... however I noticed I can no longer dim or brighten the screen using the regular method (P button upper function). This annoys me because it's easier controlling it that way than having to launch Power Hero to do it. If there's a fix for that I'd be sold on this app though. Andrew, Just thought I would mention that on my Treo 680 I have the screen brighter in the day and less bright at night so it is not blinding compared to the surroundings. Thank you Andrew for an 'exceptionally' great review. I have since reading your review got the trial version and will say it is a must have. I am now going to purchase it. With my slim SEIDIO 1600 mAH and this programme, I have no complaints re battery life. I've had a Treo for about a year now and I'm amazed at the potential this 'phone' has to consolidate and simplify my business and personal life. Thank you for the great info and insights to this amazing device (Treo 650).